We offer the best quality on market to our customers. As a Supplier, Exporter and Importer, we proudly present Kito Chain Pulley Block. We offer absolute quality, high durability and fascinating designs in our Kito Chain Pulley Block. We make sure to match the highest standards of quality. 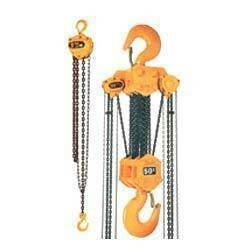 These Chain are made available bu us at reasonable prices for our valued customers.